I want to take a moment to talk about the FileMaker Layout Auto Resize feature as it pertains to portal objects on a layout. Your horizontal resize works the same as just about any other object. If you want an object in the portal row to expand horizontally, you will need to set it with the left and right anchor. If the expanded object is in the middle of the portal row, make sure the objects to the right of it have right anchors only set and make sure your portal row has both left and right anchors set. This is so as the stretching object stretches, it will not overlap the objects to the right of it and it will be contained within the portal row. Now, let us chat about the vertical stretching opportunities for portals! You have two ways to go in regards to your portals reactions to your anchor settings. You can have the portal rows expand in size but keep the same number of portal rows. 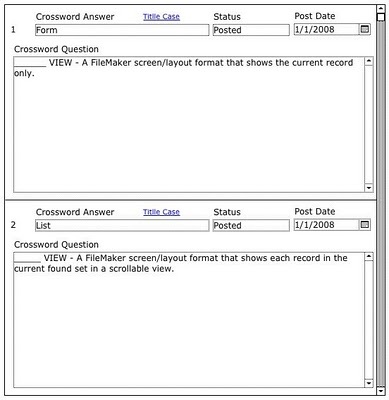 The second option is more popular, you can have FileMaker automatically add additional portal rows as the screen expands! 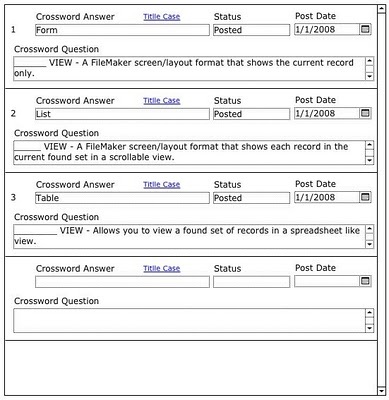 Here is a snapshot of a portal row that I use to make my FileMaker Crossword puzzles. Using this, as I write my blog posts, I can quickly copy a piece of text from the discussion and make a question and answer. This feature requires that you set the anchors for an object(s) in the portal row to expand vertically and the portal itself. So in the above example, I would want to make the question area expand in size as I resize my window. So I would set the top and bottom anchors for the question field and the portal itself. Here you can see the selected objects in layout mode and the anchor settings to get the question field area to expand within the portal row. Here you can see the results when I go back into browse mode. The question field is expanded! Here, I will want to simply take away the option for the question field to expand. I will leave the top and bottom anchor settings for the portal itself. So the portal knows that it should expand vertically but all the objects in the portal do NOT expand. So the portal is going to add more rows. Here you can see the the question field area only has the left and top anchors set. So that field will not stretch vertically. I haven’t changed the setting for the portal itself. It has the top and bottom anchors set, so it will stretch. Here you can see the results when I go back into browse mode. The question field is the same size but the number of portal rows have been expanded!